This is one of the most common tricks that car dealers pull on unsuspecting shoppers. The Lie-nance manager tell you that your credit score was much lower than it really is. This causes you to pay a much higher interest rate on your car loan than you should have paid. Keep in mind that not all finance managers are "Lie-nance managers." You see, the way interest rates work on car loans is the higher your credit score, the lower the interest rate you'll have to pay. So naturally, the lower a credit score the dealer can produce from your credit history, the higher APR they can charge on the car loan. Naturally some salespeople are greedier than others. They don't want to just sit there while you walk out the door paying 3% APR when there's profits to be made. Remember these people are sharks waiting to devour you and they have decades of honing their skills against the uninformed car shopper. This scam is typically pulled on people with marginal credit, but works even on people with good credit too. It works because most people do not know their own credit score. Unfortunately, too many people trust the official printouts produced by the car dealer without ever knowing if it's true. You often know your own cholesterol levels, but when was the last time you checked your own credit score? Remember you need to do more than just get your credit report; you need to generate that credit score number and know it just like your cholesterol. One buyer emailed us here on CarBuyingTips.com to say that his credit score was 780 (which is quite excellent) from all 3 major credit bureaus. While sitting in the finance office at the car dealership, four finance people came out after reviewing his car loan application with very "concerned looks" on their faces. They also had an official looking paper that said "credit score" on it and it also had the number 580 circled in red. Boy the pen sure is mightier than the sword. They informed our friend that they could only get him financed at 10.9% APR, not the special 0% interest rate that the manufacturer was advertising. 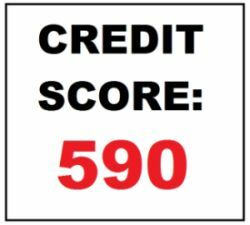 Our intended victim then pulled out his own credit score that he had just obtained that day which proved that he really had a much higher score of 780 compared to the dealer's bogus credit score. You see our friend knew had had perfect credit, never missed a payment and already knew he would have a high score. He then asked why the dealer's result was so different from his Equifax credit report which flashed back up at them. Not expecting this car buyer would know his own credit score, three of the very surprised sales guys scattered knowing they were busted. The poor last guy lied to the buyer, saying that "credit agencies display better credit scores to consumers than to businesses." Our friend then left that dealership and bought his car elsewhere with the low 0% advertised APR. This vindicated the buyer and proved the finance people were lying. Nobody should ever know more about your credit history than you do. If they pull this scam on you, then you should pull out your independently obtained credit score from TransUnion or Experian.com and put a stop to the scam. This is why we stress that you should always have all of your financing 100% lined up before you ever set foot in a car dealership. Financing for your car should be a forethought, never an afterthought in the business office. President Ronald Reagan had a famous quote "trust but verify." We have our own similar quote here "don't trust, but verify." If they try to pull this trick on you, use your pre-approved online car loan draft or just leave this dealership and take your business elsewhere. Just because they throw some printed number at you does not mean it's correct. Read our chapter on Car Loan Tips & Scams for additional information on getting your credit score and auto loan online.